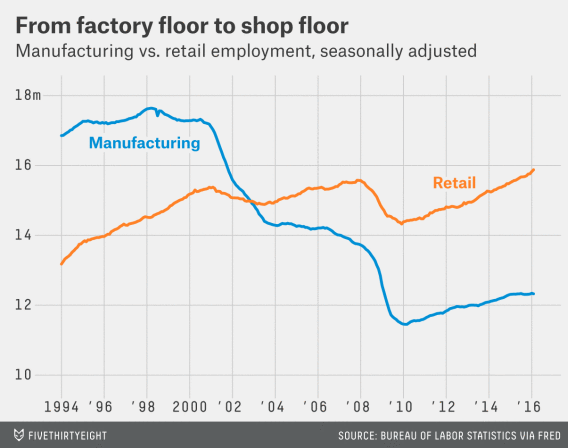 But, there’s a big difference between manufacturing plants and “output” … and manufacturing jobs. “Since the recession ended in 2009, manufacturing output — the value of all the goods that U.S. factories produce, adjusted for inflation — has risen by more than 20 percent. 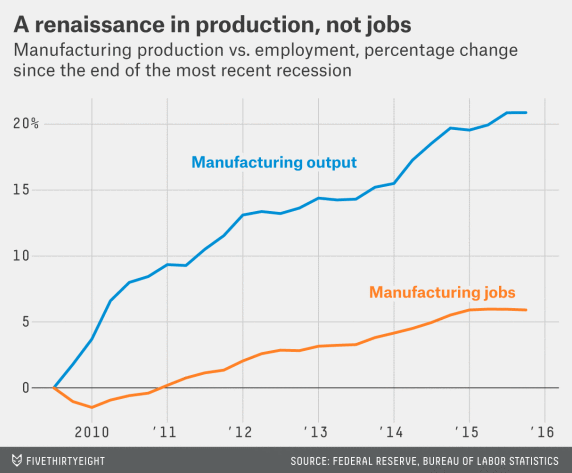 Again, there’s a big difference between manufacturing plants and “output” … and manufacturing jobs. Rather than the usual proposed bromide of just cutting corporate taxes across-the-board, why not offer employers a double tax deduction for workers’ wages earned in the U.S. … up to the FICA ceiling? Reduces the cost of labor (a bit), shines a light on employment, and only rewards companies that generate income (and pay taxes) here in the U.S. This entry was posted on November 21, 2017 at 6:59 am and is filed under Employment - Jobs, Manufacturing, Re-shoring, Tax reform, Taxes. You can follow any responses to this entry through the RSS 2.0 feed. You can leave a response, or trackback from your own site. Nice suggestion. Don’t send it to your local representative because he likely is a card-carrying limousine commie. Seems logical. By the way, Nate Silver’s website is FiveThirtyEight.